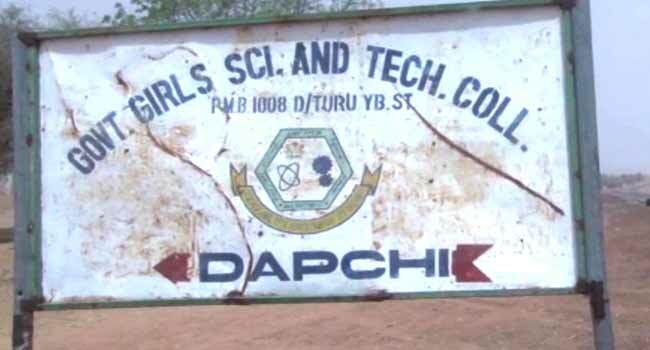 Five students of the Government Girls Science Technical College (GGSTC), Dapchi, in Yobe State, who fled when suspected Boko Haram terrorists invaded their school. The entire Dapchi community has been thrown into a sorrowful mood, following the invasion of the school by the insurgents which led to the closure of the institution (in the meantime) by the state government. However, hope seems to be returning to the community as some of the students reportedly held hostage managed to escape the terrorists’ enclave. In an exclusive interview with Channels Television, one of the students Sadiya Mohammed, who was part of the students that escaped capture when the school was invaded, narrated her experience in Hausa language. After the Federal Government confirmed that 110 students were abducted, Sadiya lamented that her best friend, Zahra Mohammed, who they do things together, was missing. She, however, said: “Honestly, we are saddened with the abduction because we don’t really gain; sitting idle at home with the value of education in our modern world cannot be over-emphasised. It is 10 days since the students were declared missing by their school authorities, as their parents have called on the Federal and state governments to ensure their safe return. President Muhammadu Buhari, obviously worried about the situation, has given the assurance that he would ensure the safe return of the girls and other citizens in the captivity of the outlawed group. The National Security Adviser, Babagana Monguno, who also met with the Yobe State Governor, Mr Ibrahim Gaidam, also reassured him of the Federal Government’s support. “I want to reassure you of the commitment of President Muhammadu Buhari in getting all these girls back,” he said. On his part, Governor Gaidam called for improved cooperation among religious, community and military leaders to ensure the speedy return of the girls.